Display these pictures side-by-side and give a candy to whoever can tell you what’s wrong with the cross section picture. 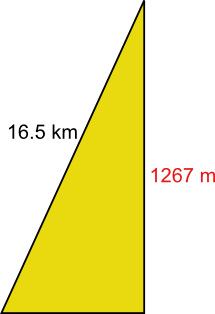 Once the bright little rays of sunshine figure out that the x-axis is not representative of the horizontal distance, let them know that they are going to be the ones to fix the x-axis and generate a whole new, better, correct set of Tour de France cross sections. What’s wrong with these cross sectional diagrams? What would the correct diagrams look like? Provide extra large paper (i.e. butcher paper, poster paper) for students to recreate these diagrams, labeling the axes properly. Or, have students diagram it out and construct a diagram in Excel. First, let’s break the stage up into a bunch of right triangles, labeling the distances as we go. Watching out for the units, and applying Pythagorean’s Theorem, we find the horizontal distance. OK so that won’t change the diagram a whole lot. I guess when the horizontal distance is thousands of times longer than the elevation gain, that won’t make much of a difference, will it? 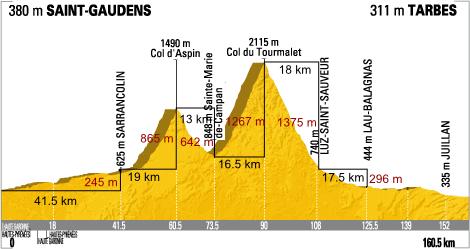 Let’s try one of the steeper sections. This should actually be the following. Again not a huge difference, but a difference nonetheless. 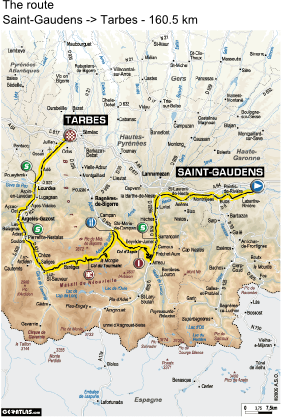 Here are a couple other stages of the Tour de France that could stand to be “corrected” by your class. Truth be told, the difference in x- and y-axis scaling does more to alter the look of the diagram than the neglect of using the proper horizontal distance as the x-axis. Still, this makes for good Pythagorean Theorem practice, if not its teaching. We could apply this to pretty much any elevation change: mountain driving, hiking, the ascent and descent of an airplane, etc. 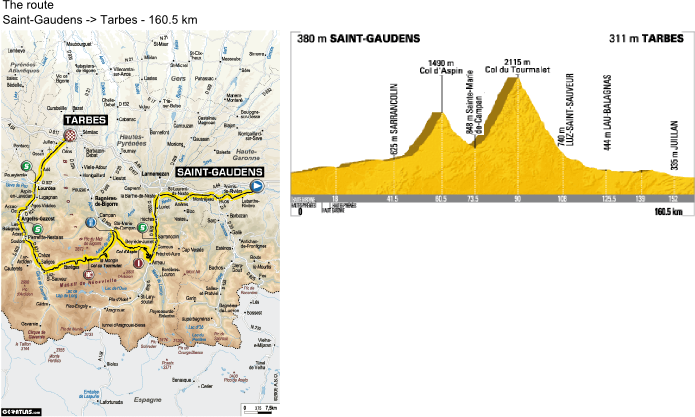 Here are a couple more stage profiles of the Tour de France for your perusal. * – the original post contained the typo “Your de France”, which is probably a good tagline for a Tour de France fan-club, but was not the intention of the piece. What if you made the vertical axis a logarithmic scale? What base would be best? This is a trick used all the time to represent data sets with very large spaces in between data points, like position of the planets in the solar system. Would this be an appropriate kind of data to use a logarithmic scale? I think it would be as good a time as any to introduce log-scale or semi-log scale axes. But just throwing this out there – if students are practicing Pythagorean’s Theorem I’m not sure that they’ll be working on log scale. That said, I’m a HUGE fan of introducing concepts earlier than they are ‘supposed’ to be introduced. I think as an enrichment aspect, it would be more valuable for this project to investigate the scaling of the axes using just linear scales than logarithmic ones, because, as you mentioned in the blog, you can make the graph show whatever you want based on the scaling. It takes a lot of critical thinking for a student to produce a graph of data that’s actually meaningful, and even more to analyze how someone else could produce a graph to elicit a specific interpretation of the data. For instance, from your graph of stage 16, after they’ve done Pythagoras’s theorem, have them reproduce the graph using the same scale on both the horizontal and vertical axes. The total delta y is 1/100 of the horizontal span – it’ll look completely flat. Why is this not how the graph was originally represented? What scale would you choose, and what does this help you say about the data? I think it would be interesting to show the students a log representation for the vertical axis, if only because I think they would be dissatisfied. When talking about things like height and altitude, you always kind of want the vertical axis to mirror the physical space, and I think they’d notice that it doesn’t…and for me its always fun and I think makes the learning valuable when I can make my students dissatisfied somehow.